In 2017, we co-organised a festival at Sandford Station retirement community. 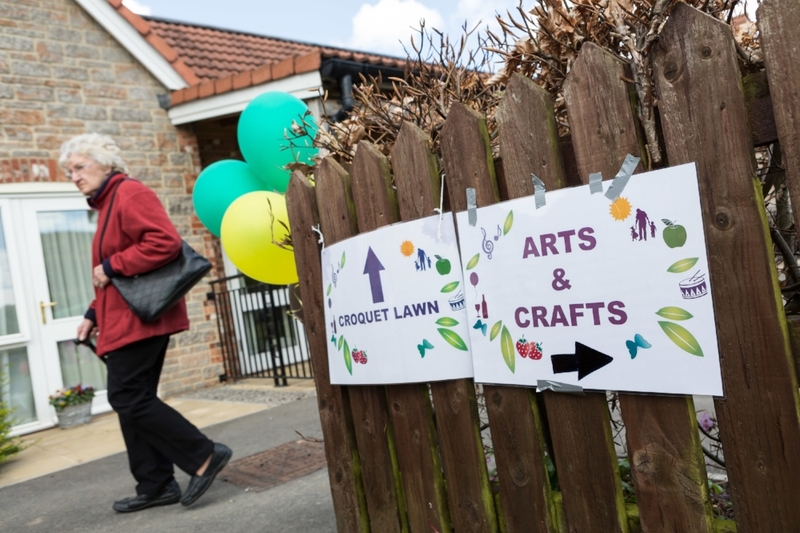 MayFest was a festival for all ages, and aimed to invite the Sandford community to join the residents at the retirement village for a day of fun and activities. In the months and weeks leading up to the festival, Wyldwood Arts met with staff and residents from Sandford Station who were already running groups, such as the play-reading group, boules group and art group. We aimed to celebrate these activities in the festival and work with the local community, and with the local school to create intergenerational projects alongside the activities already happening in the retirement community. The festival day included chocolate tasting, archery, a visual arts exhibition, samba and music workshops, face painting, boules + bowling competition, performances from the Bristol Old Vic Company, the Original Spinners and the Churchill Academy Chamber Choir, plus loads of food and drinks stalls selling delicious locally sourced produce. To close the Mayfest celebration, there was an intergenerational Samba procession across the site. To see our fantastic video all about MAYFEST click here!